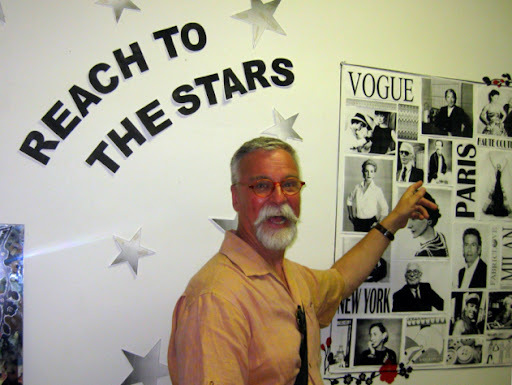 I recently had the chance to slip away to the Jersey shore for a little mini vacation. In addition to a couple of gorgeous days at the beach, I also took advantage of my proximity to New York and slipped into the city for a few hours in the garment district. Time was limited so I had to make the best of it. The garment district can be daunting to say the least, especially when I'm searching for a fabric to coordinate with a piece of rumpled velvet in my pocket, iridescent velvet at that. Talk about looking for the proverbial needle in a haystack! So with a little bit of a time crunch (It was close to 3:00 pm before I emerged from Penn Station) I made a beeline for Elliott Berman Textiles at 225 W 35th. St. I felt that this was going to be my best chance of finding the perfect fabric. Why Elliott Berman? For those of you who have never been to the garment district, there's a lot of very flashy fabric in the windows of the street level stores. It's really a visual feast. After awhile though, it all starts to look the same. And in some cases it is! We're talking a lot of embroidered polyester brocade. I've learned that to find something really different, sometimes you have to get off the street, like up to the 7th floor. 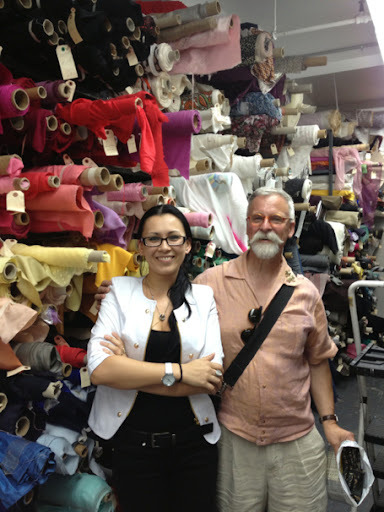 Elliott Berman Textiles specializes in imported fabrics, mostly from Italy and France. I guess I'd call it an "investment dressing" fabric source. They offer fabrics I've never dreamed of. How about a white and silver gray matelasse interpretation of The Lady and the Unicorn tapestry. They've got it! On my first visit to this store, which may have been two years ago, I balked at the prices. Oh, the regrets I have!!! I was new to sewing and it was all about getting a bargain. My "quest" was to get everything on the cheap. Anything more than $6/ yd was outrageous, until I got burned on some $10 camel "wool" that turned out to be 101% synthetic. I used that fabric to make the peacoat from the Japanese Men's Coats book, a difficult and time intensive project. Two seasons of very limited wear later, it looks like crap. The fabric has pilled everywhere, even where there is no wear, and it just looks cheap. I hate wearing it, so it's in a garment bag in the attic, where moths refuse to chew on it. It was a lesson that I had to learn. Spend more and have clothes you love vs. spend less and have clothes in the attic. OK, back to Elliott Berman. I was greeted by Eugenia, the glamorous gal in white above. No one could be more charming and helpful. I pulled out my rumpled velvet, explained my project, and she went to work finding the perfect fabric. I swear she knows every fabric in the mountain of bolts behind us in this pic. And this is but a mere corner of the store! She nailed my "needle in the haystack" in about 5 minutes. Ta Da! Here is my coordinating fabric for the reverse of the lapels. 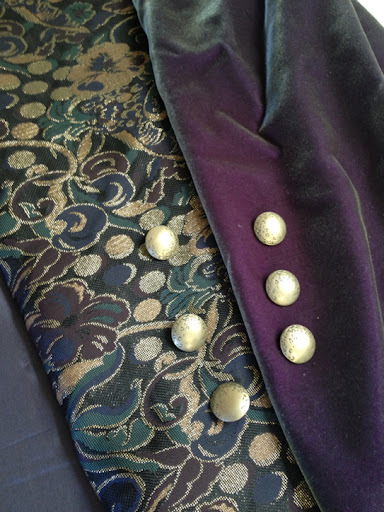 It's a metalic brocade, a dark brassy gold on black with a moody William Morris feel. The minute she tugged the bolt out of the stack, I knew I would never find anything better. It pulls the purple and the green from the velvet perfectly. Total Fabric Score! Hmmm. This is Dries Van Noten S/S 2014. I'm suddenly feeling very fashion forward! With the clock ticking I made a quick dash up to W 38th St. and Pacific Trim. They have one of the better buttons selections, and the woman who works that section of the store is always very helpful. I settled on these brass buttons with a slightly distressed texture. The sales lady totally pooh poohed my first choice, saying they looked cheap (and she was right, of course). She steered me away from plastic to metal. They're much better quality and a nice match to the metalic of the brocade. This is going to be one very opulent garment. So I finally have all the components to start constructing the jacket. I've never sewn velvet, so stay tuned and wish me luck. Excellent! It will be a fabulous garment! Marvelous choices. You will be the best-dressed Belgian chef outside of Belgium! Fantastic choices. I can't wait to see the finished product. Good luck with the velvet. Be sure to practice (a lot) with the velvet scraps. On my machine, the walking foot was useless. I hand basted a lot. Great start to a fabulous project...velvet...what a challenge and such a learn as you go garment...wishing you tons of luck and a few laughs along the way too. I'm sure you will share the highs and lows with all of us to learn tricks as well! 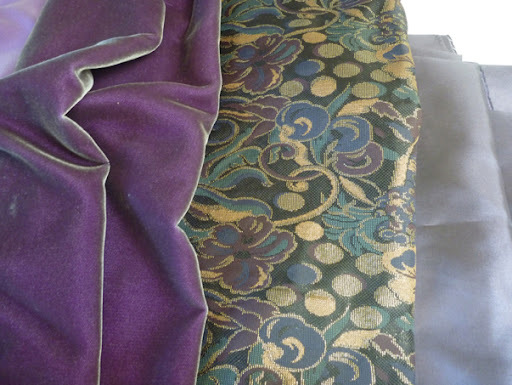 The brocade is gorgeous and really a wonderful match to the velvet. The colours and the texture of the brocade really complement the velvet. It's going to be a nice treat to work with such luxurious fabrics. Oh I am having serious garment envy here. Well, probably not garment but fabric! I can't wait to see this one evolve! Really looking forward to the evolution of this garment. You are so right about the importance of quality fabric. I'm still enjoying my quality cashmere and wool coat after five years, but the cheap poly upholstery fabric jacket is pilling after five wears!